I gave a presentation recently on the topic of mobile enabling enterprise applications. The context was that if you have a Java EE based application tucked away somewhere in your organization how do you make that application mobile and HTML5 friendly. As I was creating the presentation, it occurred to me that perhaps my presentation should be like a mini demo of sorts to illustrate some of the principles I was sprouting. I really liked the idea of the Keynote Remote app (which is no longer available) or something equivalent like Slideshow Remote. You start a presentation (the left side of the diagram above) by selecting the presentation from a browser. Yes the presentation is done on a browser like Google Presentation or Prezi. 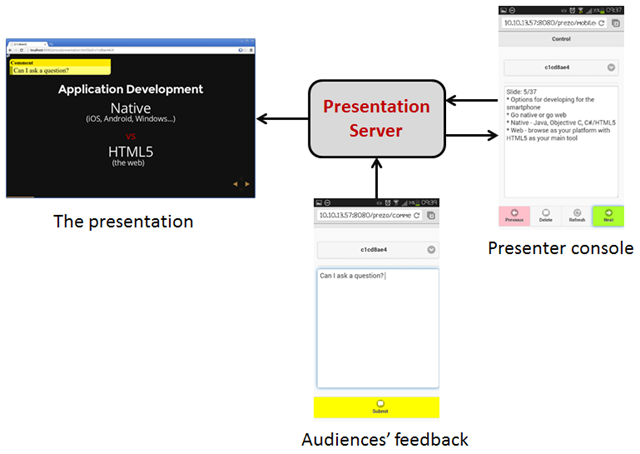 You then use your mobile phone to open the presenter’s console (right side of the diagram) to control the presentation. The console allows you to advance the slides; it also shows you speaker’s note. Participants can asked question using the comment tool. Again this is a web application. All comments are displayed on the presentation. The yellow box on the top left corner of the presentation is an example of a comment. For the impatient, the source is available here. String baseURI = req.getScheme() + "://"
As you can see the PresentationServlet sets up the initial data structure for the presentation. It generates a unique id for it. After generating the id, it loads it into memory as a DOM-like object. The ‘DOM’ is then associated with the generated id and saved in a map which in here is represented very simplistically by a Singleton EJB. We now get the browser to load the presentation by sending the following URL back as a redirect with the presentation id (pid). As I was working on this, I found a really nice HTML parser call Jsoup. Jsoup is a Java HTML parser that lets you access the HTML document using CSS selectors, just like jQuery. Bye bye XPath! We use Jsoup to parses our HTML presentation; it returns returns a Document object which we will use later to extract the presenter’s note. To learn about Jsoup, see the tutorial. Initializes the presentation using Reveal’s API. See the documentation here. Once Reveal have been initialized, it opens a server sent event connection back to the presentation server. The presentation uses this channel to listen to commands (eg. next slide, previous slide) and control the presentation according to the received commands. You can see the entire script in web/app/presentation.js in the source. 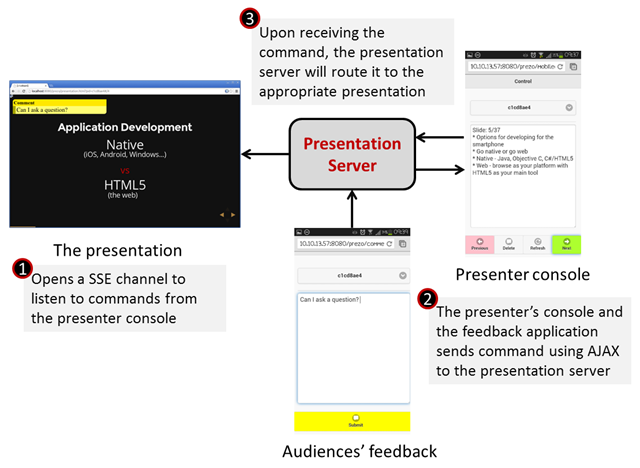 After the presentation opens, it creates a SSE channel back to the presentation server. The presentation will only listen to commands with its presentation id; it does this by listening for specific SSE packets with its presentation id . We create a SSE data, fill in the event id which is the presentation id and the command (more details of this in Presentation Control section). The command tells the presentation client to move to the next slide, return to previous slide, etc. in the presentation client (presentation.js) that registers the pid with the SSE’s event id. Side note: this is not strictly true in this implementation as all presentation clients are connected to the same SSE channel. All presentation client will receive commands regardless of whether its for them; but because they are only listening to their own pid, they will only respond if the SSE’s event id matches their pid. Ideally the SSE channel name should be partition with the presentation id viz. clients should connect to /slide-event/<pid> instead of /slide-event. The current SSE library is not able to parameterize the SSE channel name. Lets look at the presenter console. The purpose of the presenter console is to allow the presenter to control the presentation and also to look at the speaker’s note for the current slide. When you open the presenter’s console, you have to select which presentation you wish to control from a combo box. When you click on the next button (code shown above), the console will issue a command to the server using jQuery’s $.getJSON() API. The following request is made to the server to move to the next slide for presentation 123456. The code for ControlServlet is quite straightforward. We start by first constructing the command object in JSON using the new JSON API from JavaEE 7. The notes attribute is the speaker notes for the current slide. The speaker notes are extracted from under <aside data-notes=””> element using Jsoup. Look at the source to see how this is done. They are returned as a JSON array. After creating the command object, we send the object back to the presenter’s console indicating that the command have been accepted. Now we have to inform the presentation client to execute the command, which is move the to next slide in this case. Using injection, we get the handler to all SSE channels listening on /slide-event. We then loop through all the connections and publish the event. The publish event now goes back to the presentation client; the slideControl function is invoked (see Presentation Client section above) and this advances the slide. The source for the presentation server is available here. All the dependencies can be found under lib directory. The presentation server is written to JavaEE 7. I’ve tested in on Glassfish 4.0. Once you’ve deploy the application, point your browser to http://your_server:your_port/notppt. You will see the landing page. The first item is to start a Start Presentation. You must have at least 1 presentation started. Click on this (open it in a new window) to start your first presentation. Now you can select either the Control or the Comment link. The Control will take you to the presenter’s console. Try opening this on your mobile phone browser. Select a presentation to control from the combobox. Comment allows the audience to comment or ask questions on the slide. It is very easy to take the Control and/or the Comment portion and make that into an app (Android or otherwise) by wrapping the web portion only with Cordova/Phonegap. The presentation server currently has only 1 presentation. If you’re thinking of using it here are some suggestions. Add an interface to to manage the presentations. Automatically inject presentation.js into every uploaded presentation. Add security (Java EE container managed). It’s worth mentioning that Reveal.js do have a presentation console with speaker’s notes. There is another excellent blog on the same subject. Both of these approaches uses node.js as their server. I also just found out that slid.es, the people behind Reveal.js, have rolled out something similar. See the following video. The idea is basically the same except that they have done it with more panache. Go check it out. I came across the following 2 blogs (here and here) on a CDI framework for server sent event (SSE) several months ago. I downloaded the source then tried it with Vorpal running on Glassfish 3.1.x. The result was a really long exception stack. After publishing part 4 of on conversations, I decided to see if I have any luck with the SSE framework. I wasn’t really expecting it to work. Well it did. What is even more surprising is that it worked with Vorpal. What I’m going to do in this blog is explain how the SSE framework works and more importantly how you can use it with Vorpal. Its really easy. A few points to note: the notification handler must extend ServerSentEventHandler; this class is from the framework. You also have to annotate the class with @ServerSentEvents and specify the URL of the event stream. In this case it is notifications. More on this later. The important thing here is to get the event stream URL right. If our example, this is made up of the application context of our web application (in blue) and the value that you’ve specified in @ServerSentEvent annotation (in green). We now hook the event handler to a Vorpal application. I did a screencast on developing a customer query service which allows you to use a Jabber client to query a database, which you can find here and the source here. Lets extend this so that whenever someone performs a query, the result is also pushed to the browser using SSE. After we got the record from CustomerManager, which uses JPA, we loop through all the registered handlers for an event stream channel and pushes the record to them. You have to get the correct handler to push to. In our example, we are pushing to all browser registered on notifications. So we inject an instance of ServerSentEventHandlerContext with qualifying it with @ServerSentEventContext(“notifications”). You can download the example source from here. I’ve bundled the SSE library into the download which is a NetBeans project. Make sure that you’ve installed your Glassfish with Jabberwocky container. Open your browser and point to http://yourserver:port/xmppsse. I’ve tested with Firefox and Chrome, latest versions. You should now see your reply display in your Jabber client and in your browser. The source code for the SSE can be found here if you wish to look at it. Part of the code (the app.js) is taken from Bhakti Mehta’s blog. Big thanks.